‘The Government was justified in removing the Basarwa [’Bushmen'] from the Reserve… It is sensible of Government to take such action. Otherwise who would always want to remain in the Dark Ages while others move forward?' Louis Nchindo, Managing Director, Debswana (De Beers's Botswana subsidiary). The Botswana government has carved up nearly all the homeland of the Gana and Gwi Bushmen and Bakgalagadi of the Central Kalahari Game Reserve (CKGR) for diamond exploration. Most concessions were given around the time that it forced the Bushmen from their homes last year. The multinational BHP Billiton has most concessions. It has established a subsidiary company, Kalahari Diamonds, which was recently given US$2 million by the World Bank. Kalahari Diamonds has in turn set up another subsidiary, Godi, to carry out the exploration. The only Botswana citizen on the Godi board is Archie Mogwe, Senior Political Adviser to the President of Botswana, and former Minister of Mineral Resources. De Beers, which already retains a diamond deposit in the Reserve, has also increased the number of its concessions. The Gana and Gwi are hunter-gatherers who have lived for thousands of years on their land. In 1961 much of their land was turned into the Central Kalahari Game Reserve to protect the game on which they depended. But over the last 17 years, the Botswana government has conducted a campaign of harassment to drive them out, culminating in the destruction of their water borehole last year. Most were forcibly evicted and now live in bleak camps outside the Reserve where alcoholism, HIV/AIDS, and boredom are rife. 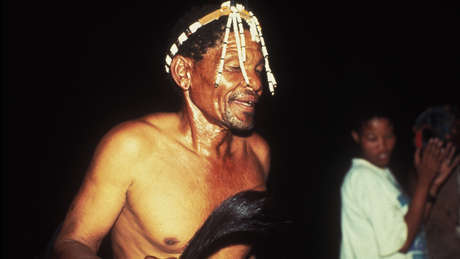 Despite intense intimidation, about 50 Bushmen refused to leave the CKGR. At least 50 more who were evicted have returned. However they face continual pressure by local officials to leave, have little water and have been banned from hunting. People from the camps have to obtain permits to visit the Reserve, are restricted to short stays, and are not allowed to bring in food or water for their relatives. The Botswana government refuses to discuss the Bushmen's right to live on their own land in peace. Instead it has hired a PR company to counter the international campaign in support of the Bushmen; the permanent secretary in the Mines Ministry (and deputy Chairman of Debswana) Dr A Tombale recently described Survival as a terrorist' organisation; and the government has banned all Survival materials from the country's schools. Asked by Survival what its indigenous peoples policy is, De Beers has admitted it does not have one, saying bizarrely that having a separate policy on indigenous rights would lead to apartheid! In Canada, however, a strong indigenous rights movement has forced the company to make agreements with Indian peoples whose lands it wants to explore. De Beers seems to accept indigenous rights in countries where it has no choice, but it does not want such notions to take root close to home in southern Africa. The head of the main Australian Aboriginal organisation calls De Beers's attitude nonsensical and offensive'. Meanwhile, in a very encouraging sign for the Gana and Gwi, another indigenous people now known as the Richtersvelders has won an historic court ruling in South Africa. The Supreme Court of Appeal has recently ruled that they have a legal right to their land, despite the fact that they have never been given title deeds and the government had always assumed that they had no rights. Like the Gana and Gwi, the Richtersvelders live in an area that is rich in diamonds. This is bound to worry the Botswana government and De Beers, as Botswana's system of law is similar to South Africa's. According to international law the Gana and Gwi have the right to decide for themselves how they wish to live, and to remain on their land. They have appealed to Survival for help in their struggle to return to their land.